I have an english mastiff that we had trouble feeding. I read your article and started making my own dog food and he loves it. No problems with getting him to eat. I put meat (chicken or beef) with brown rice and vegables. my only concern is if he is gettin all the nutrients he needs. Should I be giving him supplements? I do not do purchases of any kind online, do you have a phone number I can call to purchase your products? Hi Patricia, sorry but my organization is just not big enough to have phone operators. This is why I use Clickbank to process our orders online. They are the largest order processor of digital orders in the world, now having processed over 2 billion dollars in sales. No human ever sees your credit card details, including me… and for an extra layer of protection, you can even use your Paypal account to complete the order through Clickbank, which is probably the MOST secure type of online payment available today. Just like you don’t want your details stolen, I don’t want people ordering my products with stolen details so my choice to use Clickbank is as much to protect me as it is to protect you… they are the best and most secure. I hope this helps to put you at ease, sorry I don’t have an option for phone. I Know this is not a dog food Q & A, but this is very URGENT to me. I really need to know what your take on FRONTLINE PLUS is, how safe it is to use on our beloved dogs. It seems to me as if something that claims to be absorbed through the skin can also be absorbed into the internal organs as well, and if it is used 3 to 6 months throughout the year, doesn’t it make our pets walking chemical factories. Thinking about it as it claims to kill adult fleas ticks as well as fela eggs and larvae. I have a beautiful 4 yr old Boxer that has a heart murmur. So far she is healthy and happy, but i am looking rather fervently for a safe way to protect her from fleas and ticks. She is already taking a heartgaurd, which is a chemical she ingests. I hate to surround her with any other harmful things. Can you please give me your thoughts on this, or ideas suggestions. please i love my Boxer so much. She is my constant companion s I am disabled, and she spends 100% of every day with me. Hi Ellen, I understand your concern. You need to look for the ‘active ingredient’ found in the product and then research its effects online. I did not have my dog on flea treatment for the same reasons you have concerns but as the flea season progressed, he became so uncomfortable I realized quality of life is also a very important consideration. I did my research and found a product called Comfortis, which has shown to have no detrimental effect in long term studies, its an oral tablet given once a month. If your dog is already on heartworm, I’d consider a product which combines both flea and heartworm treatment in one dosage. Hi Andrew. Thanks for the free videos. My Yorkie is not born yet. She is due around the 24 of April. The breeder said she feeds the new puppies Purina puppy chow when the mother starts weaning them. Is this good, or should I insist on her giving her another brand? Thank you Andrew for all this usefull information! Want to do right by my pup and make sure he grows to his full potential. He is a four and a half month old Lab/Great Pyerenese and we are discovering that he also loves ground chicken and ground turkey as well. I am hoping this is a good thing???? We are SO LUCKY here in Queensland. We have BARF :Biologically Appropriate Raw Food. Prepared by a vet. We also have literally tens of millions of kangaroos. Great tucker for man and dog. My dog has diabetes. What can I feed him? Marcia the general wisdom is avoid foods high in sugar and fat so that means commercial dog foods should be avoided. Instead feed a healthy balanced diet of good quality proteins and high in fiber because high fiber carbohydrates decrease the speed at which glucose is released into the blood. High fiber carbs include brown rice, oatmeal and green vegetables. Keep in mind diabetes comes in different forms and severities so advice from your vet is important. Thanks for the tuna recipe – and for opening up my eyes! Here in the UK (scotland) we have been feding our 7 month old chorkie royal canine (as our vet recommended it) Some of the treats we give Chico, contain Ash?? WE were shocked at this – what kind of ash? Do you know?? We now have a 3 month old chihuahua, with another one at 8 weeks! Any ideas on what we should be feeding them? My chorkie is a very picky eater! p.s – thanks for all you advice! Ash is the mineral content of the food. Its officially defined as “the incombustible inorganic residue remaining after incineration; generally the mineral content of the food”. So if you were to burn the food, the remaining ‘ash’ would be the mineral content of the food… you’ll find all dog foods contain it. As for feeding your puppy, Dog Food SECRETS now comes with a special guide for feeding your pup at every stage of its development. one of your videos showed you making a recipe for a dog. 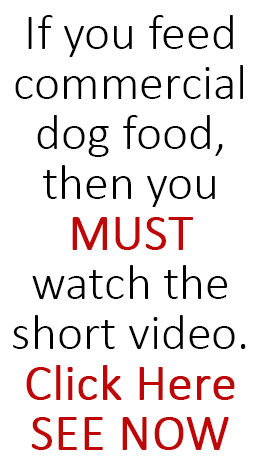 First, I question feeding a dog tune, when I wouldn’t eat it. Feeding my boys a fish that contains mecury does not seem healthy. Second, you said to microwave the bread crumbs. Microwaving food plastisizes it. If you study microwaving food, you will not suggest to anyone for themselves, or their animals. Thank you for reading my email. I appreciate it! Julie, I agree that recipe is not the healthiest in the world but the point of it was to show how quick and easy it is to make the decision NOT to use commercial, which I guarantee is many times less healthy than the tuna recipe. my wife loves to give our puppy’s table food all the time and was just woundering if it is ok to do that. they are only 7 weeks old. Its fine if its healthy table scraps and given with overall calorie balance in mind. At 7 weeks they need more protein. Dog Food SECRETS Gold Pack now comes with a guide for feeding puppies. When I was a very young child my parents were told by the doctor to feed me raw liver. Thankfully at the time I did not know what I was eating. My question to you is “Should meats be cooked or fed raw to dogs?”. I know people should eat cooked meats but what about dogs? I have six Pomeranian dogs. I wish there was a hard copy of your book as I would buy it instantly. I do not know how to use an e-book. Thank you. I have enjoyed the couple of videos you have sent to me through e-mail. Hi Leslie, ebooks are very easy to use. Download using instructions we give and then just double-click the ebook file to open it instantly for you to read. Its an age old debate, raw vs cooked. I think raw can be fine but I think 100% may be too much. Dogs have been domesticated for 10,000 years and have not eaten exclusively raw food for many generations. Also raw meat contains potentially harmful microbes. It important to remember dogs are not carnivores like cats are and can eat a diet which more resembles our own (not the same of course) and be very healthy for it. My dog, Kodi, is prone to getting bladder stones. So far he has had 2 surgeries to remove them. What kind of food do you recomment for him that would slow the process of growth of these stone? My best recommendation is see an experienced holistic vet for this one. How much for your book with the 9 dog food choices and does it come with and without this gold pack? so what do you think of merrick called Turduken it is rated a 5 star food. Hi Andrew, I’m with a Great Dane Rescue Group ( Fresh Start Dane Rescue) in Canada and I truly appreciate anyone trying to get the word out concerning the garbage that is being packaged for our pets. I’ve been flipping pet food bags for years now, hoping to find the best choice for my own Great Danes (Tucker & Loki). No I haven’t purchased any of your books yet, I guess I’m waiting for some indication that there may be some breed specific recipes. I’d be very interested in learning more about home cooking for “the giants”. The food I feed has good proteins and lacks “cheat” fillers. My approach to feeding is animal 1st, breed 2nd but I lack the confidence to play around with the lower protein needs and proper balance of calcium/phosphorus unique to giant breeds. Sadly, I see many people failing to grasp the difference between food that’s great for a smaller, high energy dog and a diet appropriate for the giant breeds. Genetics (poor breeding) play a role in bone disease BUT more often than not, starting giant breed pups out on high protein diets lies at the root of many orthopedic problems. Well, I’ll get off my soap box and ask- are there any recipes suitable for “the giants” in any of your books? Hi Leiane, no recipes specifically for giant breeds but we do give feeding amount guidance for 5 different dog sizes for each recipe. 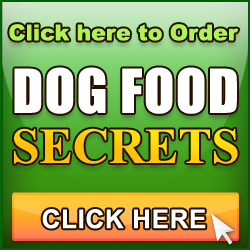 And Dog Food SECRETS now comes with Homemade Supplement Guide which shows how to easily make supps cheaply which include phosphorous and calcium. Way up a bunch of posts ago Amy said there are ads on your site for dog food and asked if you screened them. I also see the ads. They are “google ads” for Iams and links to blue buff, darwins pet and dr. harvey S. a vegetarian dog food “recommended by Alicia Silverstone”. I just thought I would let you and amy know I have those links too so you may want to ad some kind of notice to your site that you are not recommending these brands, etc. My advice Jessica is too spend the winter and especially the months leading up to summer getting her in shape with increased exercise. And the obvious is keep her out of the heat and direct sunlight because her black coat will absorb the heat. maybe even invest in a small doggy pool she can get in when she wants to cool off. Do you approve the links on your website? I am really broke right now, but as soon as I get a few bucks I’m going to buy your e-books. In the mean time, I am absolutely obsessed with my dogs, and am trying to do my best for them. I found my dog food on one of the links from your site, and it said it was good. I just wondered if you check these things out and approve them, or if they may have fibbed to me. I feed my guys (I have 4) Chicken Soup for the Dog Lover’s Soul. Do you know anything bad about them? I actually will start cooking for them full time once I am moved to our new house (the reason I am broke LOL). Hi Amy, we are VERY careful about which dog foods we recommend. 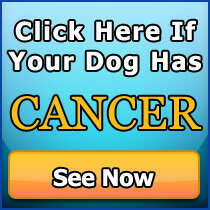 I’m wondering where you found the link because I don’t have any links on my site which go directly to a dog food brand. All our recommendations are contained in the Confidential Dog Food Report which comes with the Gold Pack and those have been thoroughly researched and checked against a list of 68 ingredients we’ve found to be deadly to dogs but still used in commercial food. The brand you are using Amy is not one we recommend. You said that egg is good protein for dogs right ? Do we feed them raw or boiled ? Thanks Lynda for sharing that great advice… you also made me laugh with that comment about running thru the fields eating sorghum. I grew up on a farm too and admit I never saw that either! i have given my puppy’s scrambled eggs soft of course for some time and they just love it. when i had my other dog i would do that three times a week and it made his coat shinny and soft. Yes, eggs are known for making a good coat. Not recommended as the only protein source and some dogs get an upset tummy. I quite like Blue Buffalo. If she is overweight and gassy, try feeding her a meal with higher protein and more fibrous vegetables like carrots, broccoli stalks, cabbage leaves etc. Dog Food SECRETS contains plenty of recipes made with veggies. I live in England and used to and will in 2 years move to Australia. Would the Confidential Dog Food Report help? I’m getting my puppy next week. It’s a German Shepherd. I was going to get the Gold Pack (not ME but my parents) but I don’t live in North america. I lived in Australia and then moved to England 3 months ago but am moving back to oz in 2 years… So would it be pointless in getting the Confidential Dog Food Report? Or would they have the same companies? And do you respond to email? We have about 50,000 people receiving our newsletter so its not possible to respond to emails, however, we do respond to customer emails. Silver pack is best for your situation, good luck with your new dog! In response to Ryan’s post and for your own info, Arden Grange, James Wellbeloved, Burns and Wainwrights are all mid-price range commercial dog foods available in the UK … still rubbish, but better than the ultra-cheap stuff. Corn, soy and/or rice are the main ingredient in all these brands … even the ones that list whatever the meat is as the ‘primary’ ingredient. You only have to look at the back of the packets to work out that ground rice + rice starch + rice gluten + rice protein actually places rice (and/or corn and/or soy) as the main ingredient type, not the meat! What does ‘primary’ mean anyway? It doesn’t mean ‘main’ (have a look in the dictionary). Another popular commercial dog food word (and one that all these 4 brands use) is ‘hypo-allergenic’. The reason why lamb became THE hypo-allergenic meat in commercial dog foods was because until fairly recently, lamb had never been an ingredient in commercial dog food, therefore dogs hadn’t become intolerant to lamb protein. This made it appear to be ‘hypo-allergenic’. There is actually no such thing as hypo-allergenic dog food, just food that some dogs have less problems tolerating than others because they probably contain less or no low-quality protein sources (such as wheat). Any ingredient can be branded as ‘hypo-allergenic’ – there is no official criteria that an ingredient has to fulfil to be labelled ‘hypo-allergenic’. Incidentally, food allergies are extremely rare in dogs – what is more common are food intolerances, which are not allergic reactions to food, but rather a reduced ability to digest/assimilate/eliminate certain substances within those ingredients (commonly glutens). I feed my own dogs, Tilly (Lab/terrier) and Beau (Lab), on a mix of ‘Origin’ and ‘Acana’ kibbles – Origin is 70% protein from high-quality meat and 30% from botanicals/veges/herbs, Acana has the same ingredients but in a 60:40 ratio of meat to veg – ‘Terra Canis’ and ‘Hermann’s Organic’ tinned meat/veges, plus a bit of home-cooking using eggs, tinned fish and veges. All these brands are available in the UK via on-line shops and I have chosen them because of their farming practices and the quality of their meat proteins. I would love to feed only raw or home-cooked, but my husband is vegetarian and gets very upset about just the thought of having ‘loose’ meat (i.e. not in a tin!) in the house, let alone me preparing it and cooking it in our kitchen, so I have to do the best I can within these limits. A feed cheese as an occasional training treat. As far as I am aware, about 50% of dogs are lactose intolerant, which is why cheese doesn’t suit every dog. Thanks Andy, warmest wishes to you and your dogs from Lizi, Tilly and Beau. a great post, thanks for helping out all our readers in the UK. Dogs can be intolerant to some proteins and it is called a protein allergy. I’ve spoken with holistic vets about this and often when a dog appears to have a food allergy, changing the type of protein you regularly feed your dog can solve the problems. Cheese should be fed in moderation, that’s for sure. But most dogs love cheese so a little now and then is fine. Some take the ‘health-kick’ too far when it comes to their dogs and deprive them of any type of treat they love because it is not the ULTIMATELY NUTRITIOUS food. Yet I can almost guarantee these people treat themselves occasionally to something that is not healthy, but delicious. Why should our dogs miss out on the same pleasure? Do it sensibly, in moderation and no one gets hurt. Thanks again for your input Lizi! As a dog lover and an animal lover in general (and a vegetarian) I am concerned both about my dogs’ health and the treatment of animals in food production. Your video about good and bad proteins interests me because it seems to contradict information from other sources. “Yes, dogs have no problem being vegetarian. Dogs do not have to rely on eating meat as they can find all the nutrition that they require from non-animal sources. There are thousands of healthy dogs living on vegetarian diets without any problems. And I have read that dogs lived happily and healthily on non-meat foods during WWII. The dogs I have owned and currently own had / have various meat-based diets – usually involving canned or dried dog food plus cooked fish or meat. We are also giving home-cooked chicken to our remaining dog, as we did to her recently-deceased companion. All of our dogs developed degenerative diseases, like arthritis, tumours, kidney problems, etc. so I don’t see a meat diet as being so beneficial to dogs. In addition, I recall when I was young we had a dog who got a lot of fresh meat because my dad was friendly with a butcher. This dog died younger than my later dogs from another degenerative disease. I don’t claim that the meat diet caused the problem, but it did not give him any better health than dogs on vegetarian diets I have read about. Yes its true dogs are omnivores and not strictly carnivorous. The video was not saying use protein and nothing else, it was to show which proteins are very high quality for your dog…. if you take a look at the recipes in Dog Food SECRETS you’ll see all our recipes use vegetables, rice, oats etc as well as great protein sources. I’ve heard of dogs doing well on vegetarian diets but not tried it myself. Dogs require adequate protein or they have a host of problems so anyone considering a vegetarian diet, please do it carefully after plenty of research. The anecdotal evidence you provided on the different diets results you’ve seen is insightful. MY DOG NAME IS TINKER AND THE 3 GOOD PROTEINS STILL GOOD FOR HER SHE A JAPENES CHIN AND SHE A VERY SMALL DOG HER AGE IS 9 YEARS OLD.YOUR REPONCE WOULD BE MUCH APPICEATED.THANKS A GAINE. as a general guideline the 3 proteins are good for all dogs. hi hesham, skin problems are very often from diet. we haven’t covered UK brands in our books yet so no brand specific advice but I recommend you take a look at our book ’68 Dog Food Ingredients to Die For’ where we profile 68 ingredients that are harmful or useless but still commonly used in inferior dog food. I noticed in the video you mention this book is included as part of the Gold plan which I purchased. Is this a download that I missed somehow or is it being mailed as a hard copy? I am cooking for Boo right now but plan a 3 1/2 month trip with him in January and likely will have to buy some commercial food during that time. Therefore my interst. What exactly, is the ‘gold package’ and how do I get it? Hi Andy – I am interested in the Confidential Dog Food Report. Is it possible to order just this. So far I’ve only ordered the Transitional Book to begin with and wrote you about the success of Tuna/egg recipe. Sorry Dee, its only available with Gold Pack.. we have no processing or download function setup to sell the books separately. At the moment the only way to get that book is to buy the Gold pack because we’ve got nothing setup to manage a purchase.